Did you upgrade Banished to 1.0.7 and upgrade CC to 1.72 but still want to use MegaMod? Well this is your lucky day. It will let the items with new flags be processed at the old production buildings that would otherwise have issues with them. It does not change the little limit spinners on each of the buildings, and this little mod never will. There's may still be some weird incompatibilities between CC and MM, but hopefully this should smooth a few of them out. Let me know how buggy it is, because again, it's extremely untested. Thanks estherhb for doing the boring parts while I was at work so I could get this done faster. And if you complain that it turns everything red, I may just slap you. Tried to fix a weird little bug where the Storage Cart wouldn't store your initial supplies on a hard start. I'll check when I get home, but is this a new game? Installing this mod mid game will make things act weird. I hate to sound like the dummy I am, but how do I find out which versions of anything I have? 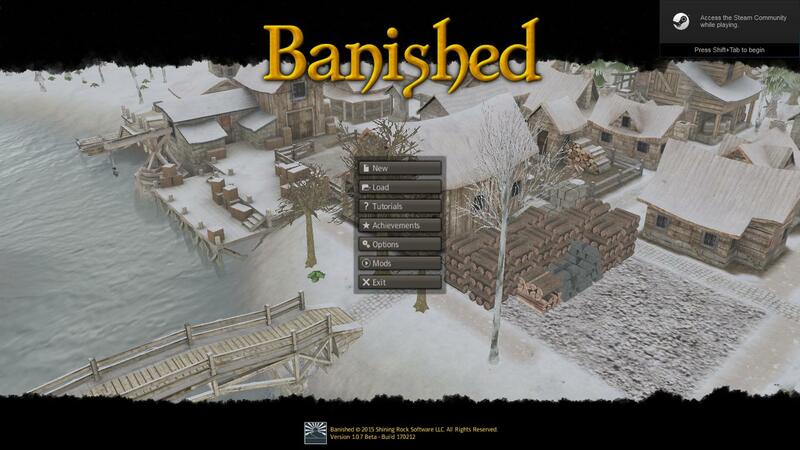 My Banished game on Steam has (beta) after the name, but as for the rest, I am clueless. Help? but how do I find out which versions of anything I have? If you look all the way at the bottom, it says "Version 1.0.7 Beta - Build 170212". That's what version you have. I'm not sure. Everything looks good. I don't know why it wouldn't be getting stored in the Tithe Barn. Does it get stored anywhere else? Do we still need this mod, I do have issues but the megamod seems to be fine hmm. you still need to load you climate mods first, they don't work at all once you start CC. They sure don't seem to be working in my game. I choose Apallachin Adam and Eve start. sorry I mispelled that but you get it i'm sure. This mod is not working correctly at all. I can play 1.72 with MegaMod 0.07 without it, and it appears to start semi normal, although the cart has no firewood in it, it is still playable. I have had several successful starts, However I've not gotten to all the construction building but the homes I've used had all been built. and the assortment of crafting building needed to start a game all work. but I've not gotten any farther then that at this time. Marble Quarry is still using "Dry Goods" as item type causing the items to be dumped into the new "Textiles" category. Medieval Clay Pit is using "Materials" limit instead of "Raw Materials", causing the clay from here to be dumped into the new "Minerals" category. whamod is the marble quarry in???? as to your conflicts: are you using the compatibility 1.07 mod?? Marble Quarry is from Colonial Charter I believe. And yes I am, hence why I'm reporting the bug here in the compatibility mod page. 1. Delete anything from Banished & Mods & Data etc. That fatal error you are seeing is fixed by deleting a file with regedit. I will try to check when I get home but googling that error will lead you to the right file within the first few results. I have also a problem. I used the CC 1.75, Megamod 0.07 and MegaMod decopack 0.07 + the 1.0.7 compability. Everything works so far, BUT i see a dot. I have 170212 that is also not working. Now i updated to 170910 and that's also not working. When i use the debug menu and click on 'spawn a infection' i get a crash. The Debug Menu mod simply gives you access to the Debug Menu that is built into the game. Have you tried unchecking the Debug Menu in your mod list? I use the Debug mod and it works just fine but I've never tried to make a disaster happen. That's not your problem. One thing that often helps is to go into Regedit and eliminate all the mods and start over. Never just remove mods from your WinData folder without doing this step. The other advantage I have is my game isn't from Steam. I couldn't get the Steam game to run without crashing so bought it from HumbleBumble. No crashes after that. I don't have the mod, because I used the cc mod with mega mod and deco mod. aaa que es el CC 1.75? Not sure what you are asking, but this is my best guess at the right answer: You need to use the most current version of Colonial Charter - 1.76. You should not use the Compatibility mod with it.